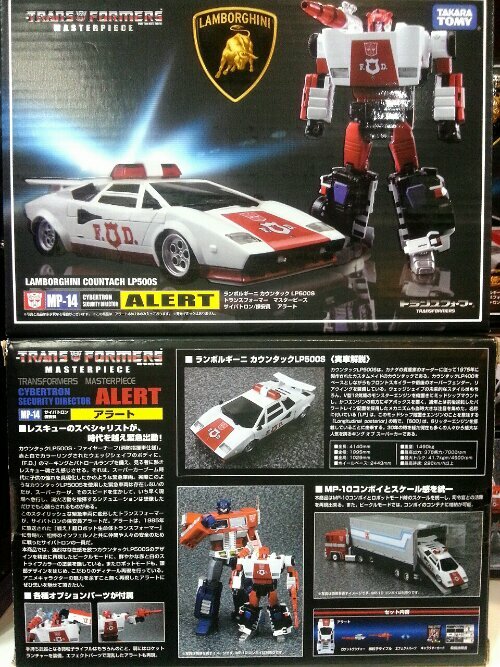 Takara Tomy Transformers MP-14 Red Alert Masterpiece figure is available now at Toy Garden and Toywiz Malaysia! Red Alert serves as the Autobots’ security director with inordinately dedicated aplomb and frazzled anxiety, making him mildly off-putting to many of his fellow Autobots. Capable of triggering alarms in other Autobots, Red Alert is himself benefited by excellent sensory perception, although he is unfortunately prone to knee-jerk reactions and preemptive quirks of judgment that can sometimes cause damage to himself and other Autobots. Red Alert is equipped with a 25-mile range rocket launcher and particle beam rifle. Lamborghini Countach LP500S as Red Alert, Official licensed from Lamborghini and comes with serial number sticker on the box. Available at Toy Garden and Toywiz Malaysia for RM199.